I’ve been using my Instant Pot for quite a while. Throughout that time, I’d heard so much fuss about Instant Pot eggs but didn’t understand what the big deal was. Until I tried it myself! My first reaction was OMG – these are the most perfect soft-boiled eggs ever! Back in China I enjoyed boiled eggs for breakfast. The cooking became such a hassle after I moved to the US. First of all, the electric stove takes forever to boil a pot of water. Plus, since the heat is harder to control, I can rarely get the tender texture I prefer. 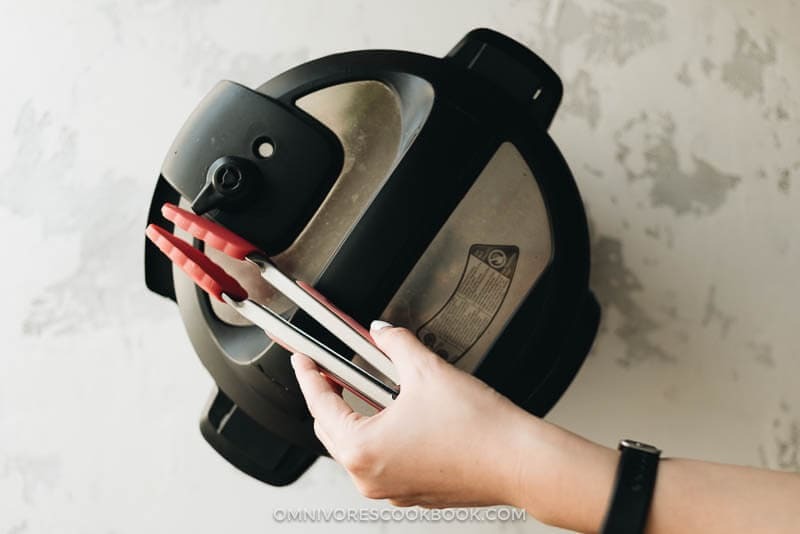 All these problems are solved by using an Instant Pot! The results are very consistent. If you’ve been boiling eggs on the stovetop, you probably need a bit of luck to get the desired texture. In an Instant Pot, you can get perfect hard-boiled or soft-boiled eggs every single time. The cooking time is super short, plus you don’t need to monitor your pot. 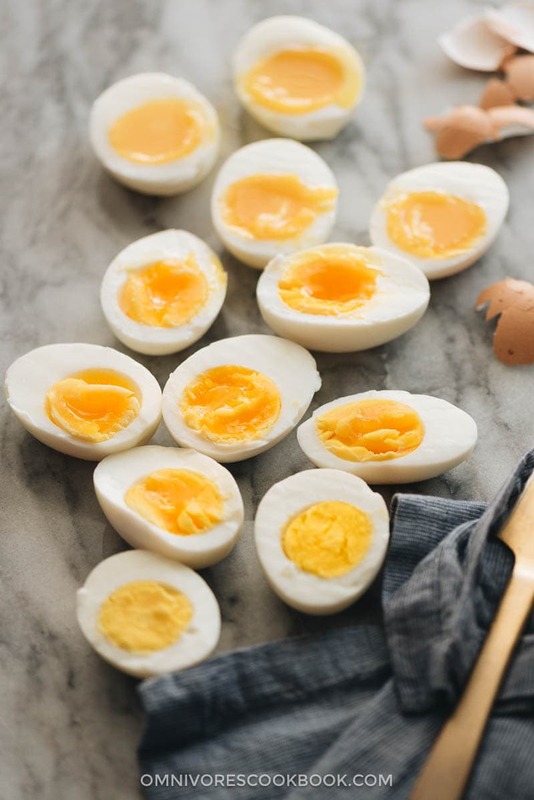 The perfect soft-boiled eggs take as little as 2 minutes to cook under pressure, with 5 minutes to add the pressure before that. The eggs are very easy to peel. You can make a single egg or as many as a dozen eggs in one batch. 2. How many eggs you can make? The answer is: as many as you want, but you need to make sure the eggs don’t fall into the water. You can even stack the eggs in two layers, so you can make more at one time. You will need to pour one cup of water into the Instant Pot. Then place the trivet inside the pot, then place the eggs on top of the trivet. During cooking, the eggs will be steamed at high pressure. Once done, move the eggs into an ice bath for a couple of minutes to cool. It yields very consistent results, is quick to cook in batches, and the eggs are super easy to peel. I used a 6-quart Instant Pot to make 6 large eggs. I’ve also tried cooking between 2 and 10 eggs at a time. The cooking time stays the same, regardless of quantity. 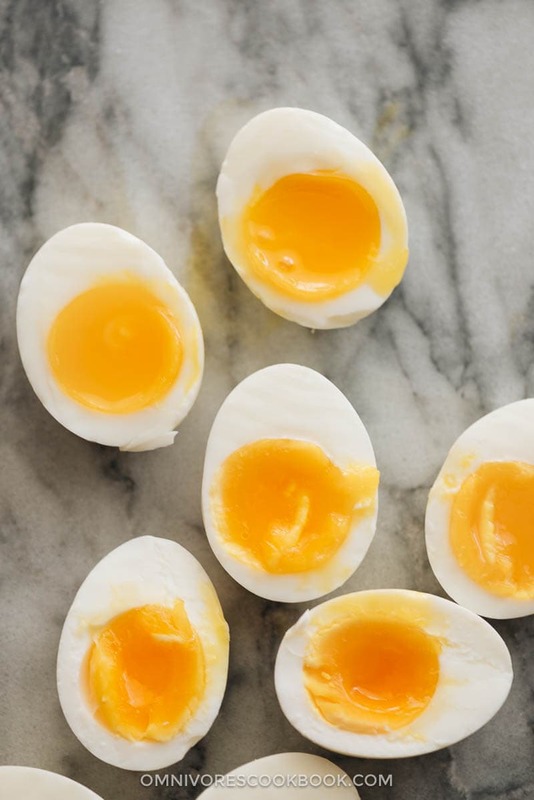 Soft-boiled eggs: 3 to 4 minutes at high pressure. My favorite cooking time is 3 minutes, at which I get perfectly cooked egg whites with runny yolks. 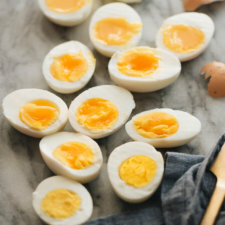 Medium-boiled eggs: 5 to 6 minutes at high pressure, where a portion of each egg will harden and the rest of it stays very tender and creamy. 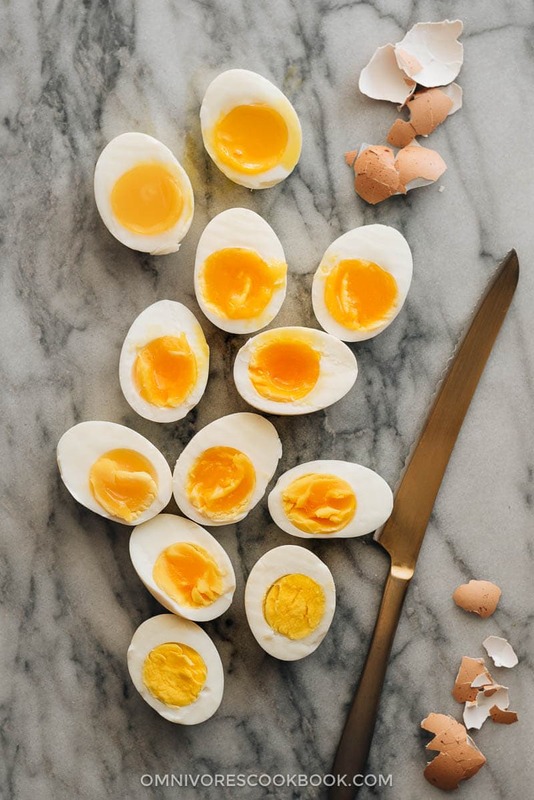 Hard-boiled eggs: 8 to 10 minutes at high pressure. Personally, I like the results after 8 minutes, where the egg yolk is fully cooked but still soft. At the 10-minute mark, the egg yolk will be cooked further but won’t taste too dry. The 10-minute eggs are perfect for deviled eggs. Always use fast release immediately after the eggs are done cooking under pressure. If you leave the eggs in the pot, they will continue to cook in the residual heat and your eggs will be overcooked. To safely release the pressure, use a long spatula or a pair of tongs to move the valve to the release side. Do make sure your hand is not over the valve while doing this. 2. Does egg size matter? The answer is: yes. This recipe assumes you’re using large eggs. If you’re using medium eggs, reduce the cooking time by 1 minute. If you’re using extra large eggs, add 1 minute. 3. Why use an ice bath? The ice bath will cool the eggs immediately so they won’t keep cooking in the residual heat. Plus, the eggs will be “shocked”, which makes them very easy to peel. What if you don’t have ice? No problem at all! Simply run the eggs under cold tap water for 1 to 2 minutes, until they are cooled enough to peel. The eggs might be slightly easier to peel using the ice bath method, but the tap water method is a lazy one that I use all the time. Why did my eggs come out too hard or too soft? This is the most common question. Remember, many factors affect the cooking time needed for perfect eggs. For example, high elevation, the size of the eggs, the temperature of the eggs, quantity of eggs, the model of your Instant Pot, etc. I’ve seem many recipes for Instant Pot eggs, but none of them share the exact same cooking time. 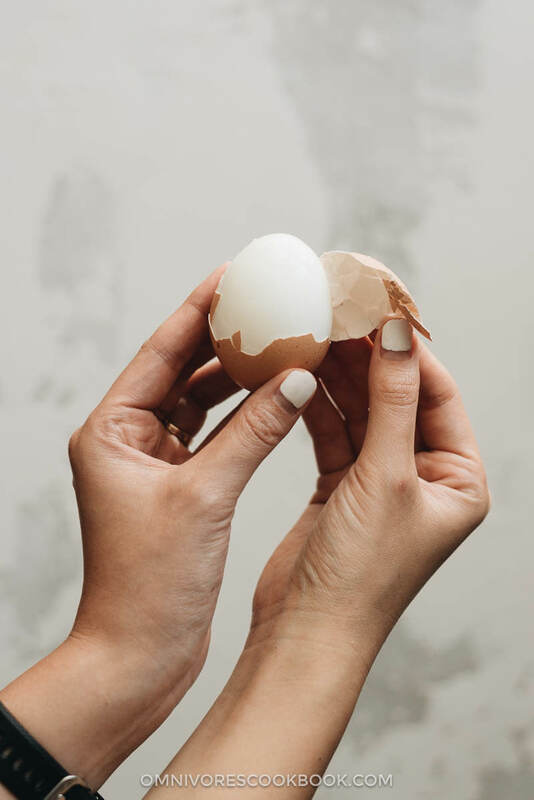 In general, if you’ve followed the recipe but did not achieve your desired results, simply add 1 to 2 minutes to get a more cooked egg, or decrease by 1 to 2 minutes to get a softer egg. Test until you achieve the texture you prefer. Why did my eggs crack during cooking? Make sure you place the eggs on the steaming rack without letting them touch the water. If you put the eggs directly into the water or partially in the water, the eggs might jostle during cooking and crack open. Also, stacking too many eggs can also cause cracking. 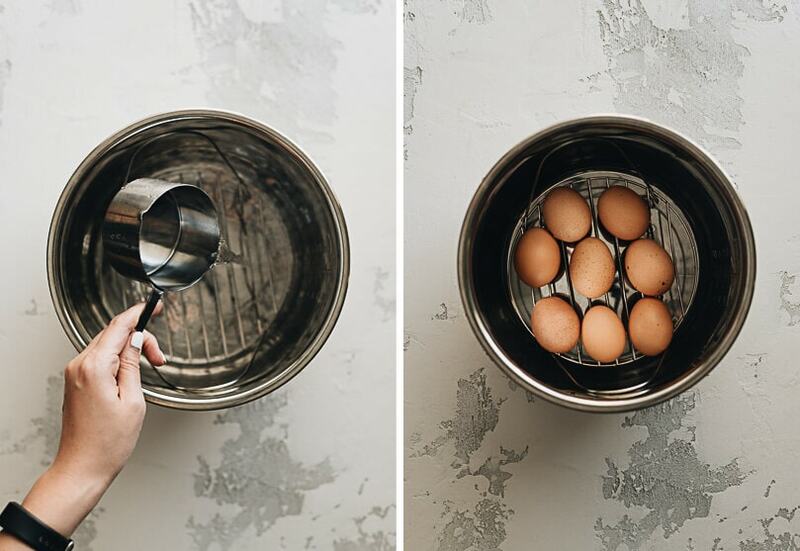 If you want to cook more eggs in one batch and minimize cracking, investing in an egg rack might be a good idea. To tell you the truth, if you are as big a fan of boiled eggs as I am, I would invest in an Instant Pot, if only just to make perfect eggs so easily! They are that good and that convenient. And of course, there are so many other great, easy, and delicious dishes you can make using an Instant Pot. Place the steaming rack (or the egg rack) in your Instant Pot and pour 1 cup water into the bottom of the pot. Place the eggs on the rack in a way that most of them don’t touch the sides of the pot. Close the lid and seal the valve. 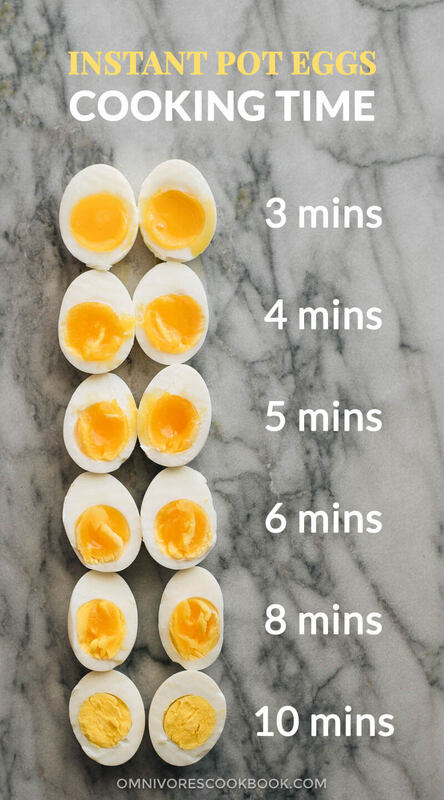 Press the “manual” button, set the pressure to "high", and set the timer to get the preferred results: 3 minutes for perfect soft-boiled eggs, 5 minutes for medium eggs, and 8 minutes for hard-boiled eggs. To get an idea of the egg yolk texture, check out the infographic in the blog post above. Prepare an ice bath by combining a few handfuls of ice and some water in a big bowl. When the cooking is done and you hear the beep, immediately use a pair of tongs to turn the valve to release the pressure. Be careful not to put your hands or face near the valve, so the steam won’t burn you. The release will be quick, less than 1 minute. Once the pressure has released, you will hear a small click. 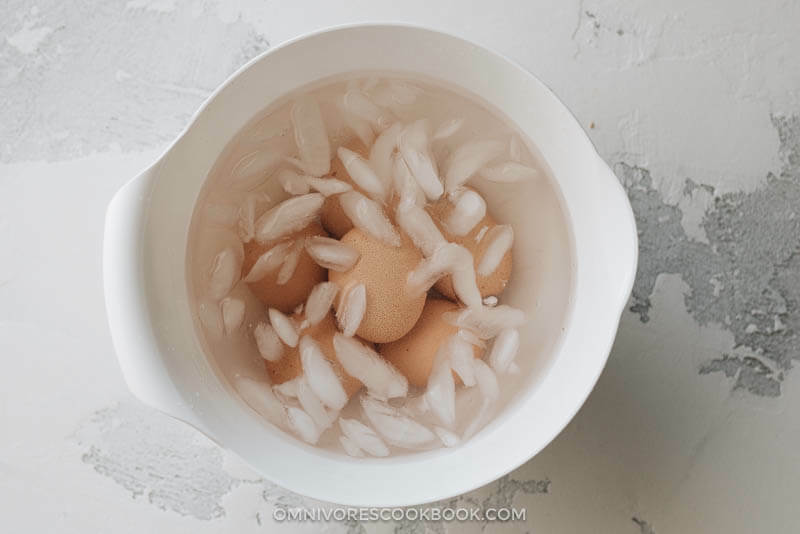 Immediately open the lid and use a pair of tongs to transfer the eggs into the ice bath. Let cool for 1 to 2 minutes, or until the eggs are cooled enough to handle. Peels the eggs and enjoy! You can store the eggs in an airtight container in the fridge for 3 to 4 days. Bonus tip: my family’s favorite boiled egg dipping sauce is: 1 tablespoon light soy sauce + 1 tablespoon Chinkiang vinegar + 1 teaspoon sesame oil. Try it once and it’ll blow your mind. We have the Instant Pot ultra 80 (8 quart). I followed your instructions for a hard boil at 10 mins on high pressure steam setting. They turned out fantastic! After the ice-bath they pealed like a dream. I wanted to also add that I skeptically tried your variation of a dipping sauce. I was thrilled with it!!! I will so be dipping my boiled eggs in that going forward. It seems like it would make a really good Asian salad dressing too. I’ll likely try that soon with sliced boiled eggs and mandarin orange pieces. Thank you for sharing that dipping sauce idea. Hi Gabriel, I used High Pressure setting for this recipe. Thanks for reminding me about this. I’ll add it to the recipe now. Just cooked 2 soft boiled eggs for 3 minutes and they came out PERFECT. So grateful you posted these instructions. Thank you! My daughter requests her soft boiled eggs to only be done in the instant pot now!! What temperature are your eggs at the beginning? Cold from the fridge or room temp? Hi Judy, I used the cold eggs directly from the fridge. My first Instant Pot attempt at anything after the water test. Put 1 cup of water in, put the wire rack in the bottom, 4 cold large eggs, cooked 5 minutes on high pressure, instant steam release. Straight into an ice bath. Eggs whites were not cooked through and runny/slimy although the yolks were what I’d call perfect soft boil. They were also extremely hard to peel and lost about half the whites to sticking to the shell. Hi Tim, I’m sorry to hear the eggs did not come out as well as you expected. I wonder if you live in a place with high altitude? I think it affects the Instant Pot cooking time (refer to https://healthyinstantpotrecipes.com/instant-pot-high-altitude-cooking-time-adjustments/). There’re other factors that affect cooking time, such as the size and brand of Instant Pot you use. I do remember that I’ve seen varies IP egg recipes online and some of them require longer cooking time than mine. My recommendation is to experiment with your setup (maybe try out cooking for 8 or 10 mins) and find out the perfect cooking time. Thank you for the article. I am planning on buying an Instant Pot. Can you tell me which version you use? There are many models between Duo and Max. Hi Erik, I used the most basic Instant pot Duo 6-quart (the first one pops up on Amazon if you search Instant Pot). It has been working well. I think other versions have added functions, but the basic one does well if you don’t need those features. I had extra-large eggs, so I steamed them at high pressure for 11 minutes, followed by the ice bath. Worked perfectly, and easy to peel. Thanks! Awesome post! Very informative and helpful in deciding how much time vs. how runny the yolk I want. I did your recipe for 10 minute eggs and they came out perfect. They turn out perfect every time. Peel so easily! Ow does high pressure translate to a stove top pressure cooker? 5 , 10 , or 15 pounds? I tried it with 14 eggs in the steamer basket. I cooked them for 10 minutes then the ice bath. The eggs peeled so easy. I’m going to have beautiful deviled eggs!